Studies show that sitting for long stretches of time is bad for your health. Spending less time in a sitting position offers numerous possible health benefits, including a reduced overall risk of dying. 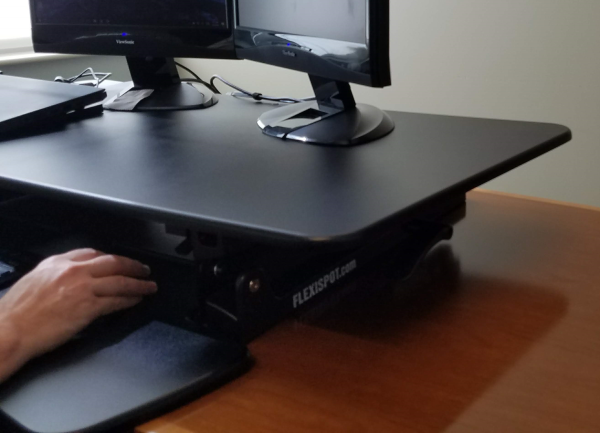 One thing you can do to reduce your sitting time is to use a standing desk like the Flexispot M3B. For Amazon Prime Day, you can get a great deal on the M3B – save $105 on the FlexiSpot M3B when you snag one for $244.99 (regularly $349.99). 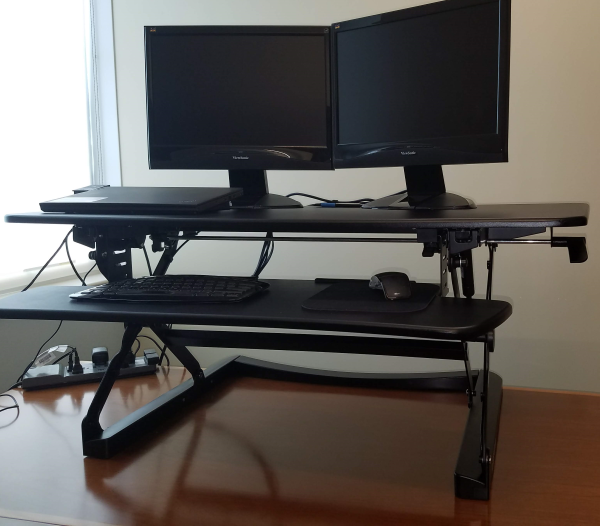 We tested a FlexiSpot M3B standing desk, and setup couldn’t have been any easier. The unit was mostly pre-configured, so no tools were necessary to set it up in about 10 or 15 minutes. 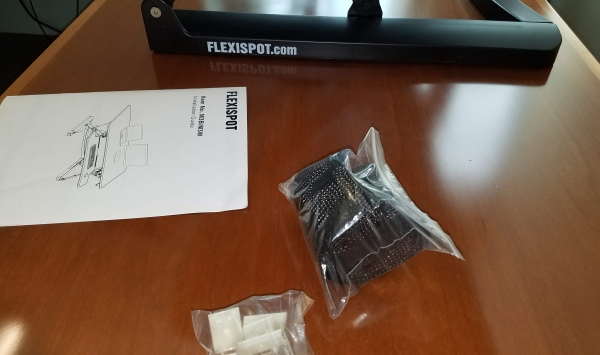 The Flexispot sits on top of your desk rather than replacing the desk and doesn’t really change the amount of desk space you have available. The test subject is more than six feet tall and has no trouble adjusting the standing desk to a comfortable height. 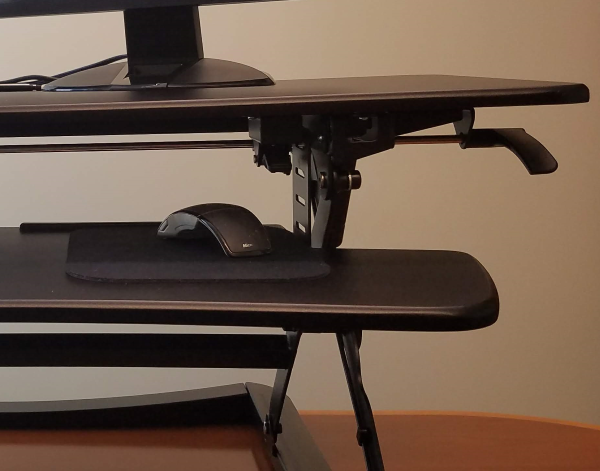 It’s simple to raise and lower the M3B to change from sitting to standing and back again. The unit moves up or down with one handle and locks securely into place. The M3B is exceptionally sturdy and heavy. The box requires two people or one very strong person to lift and carry it. After using the standing desk for a while, standing actually becomes the more comfortable position, with sitting in a chair the more awkward way to work. 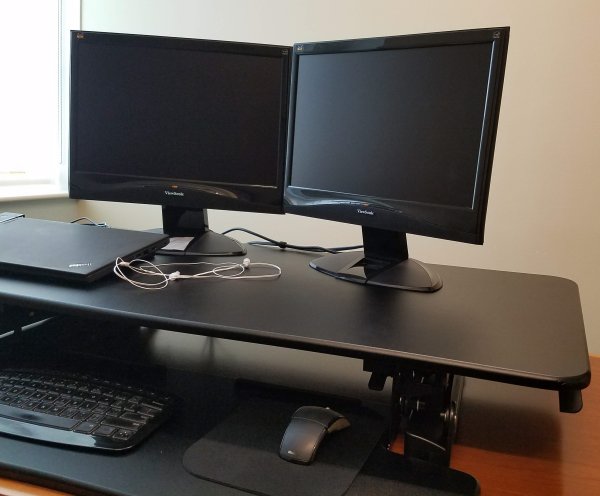 LivingWithBeth was provided with a complimentary Flexispot M3B ergonomic standing desk product for evaluation purposes. All stated opinions are honest and unbiased. Find more amazing Prime Day Deals here! Amazon Prime Day 2018 Deals You Can Get Now! I have one of these and love it! I use it at my office and stand most of the time. Thanks for review. We are looking at these for long trading sessions. Would it hold more than two large pc monitors okay? Yes, this model holds 2 monitors. The PC setting is really impressive . I think it is suitable,e to work for high graphics design apps development also most favorite game playing. Thanks for this post and sharing your experience!